Did you know you can view your grades from past semesters on the mobile app? Just tap “MyRU,” log in with your NetID and password, and tap grades. You can use the down-facing arrow at the top left to choose the term for which you’d like to see your grades. 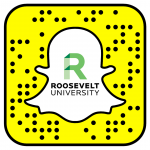 Remember, you can download the Roosevelt Mobile app at http://roosev.lt/ru-ios (for iPhone or iPad) or http://roosev.lt/ru_androidapp (Android).